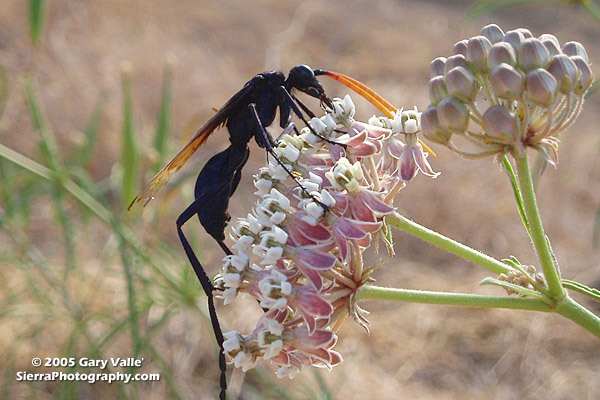 Tarantula Hawks are among the largest of wasps, and are said to have one of the most painful stings of any insect. As chilling as any science fiction, female tarantula hawks hunt, attack and paralyze a tarantula, and then use the spider’s inert — but still living — body as a host for the wasp’s egg and developing larva. Males have straight antennae, and females curled antennae. This may be because the long, showy antennae of the male would be a serious liability when battling a tarantula. The title photo is of a male on a narrow-leaf milkweed (Asclepias fascicularis) at the start of the Chumash Trail in Simi Valley. 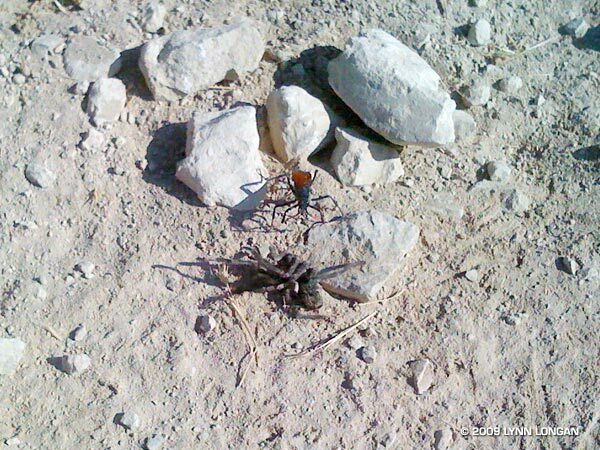 Here’s another photo, taken in Las Llajas canyon by runner Lynn Longan, in which a female tarantula hawk has just attacked and paralyzed a tarantula.